September is here. The entire Chilean investment community has been looking forward to this month for many reasons. For one, the transition of operations of the Chilean indices has been completed. S&P Dow Jones Indices (S&P DJI) is now the official index administrator of the Bolsa de Santiago’s indices. Secondly, the rebalancing and reweighting of many of the indices will be taking place in September. This means that many of the changes we previously announced will finally be implemented. Despite what appears to be a great disruption in the indices, the market overall seems to see these changes as a timely and positive step in the future development of the Chilean benchmarks. Let’s be specific about what is happening in September. First, as previously announced, the indices will undergo their corresponding rebalancings or reweightings. What is the difference, you ask? A rebalancing, in the context of this document, refers to changes in the composition of the index, as well as the shares outstanding and float factors. A reweighting is an update of the weights, shares, and float factors. Normally, there are no changes to the composition of the indices during reweightings. 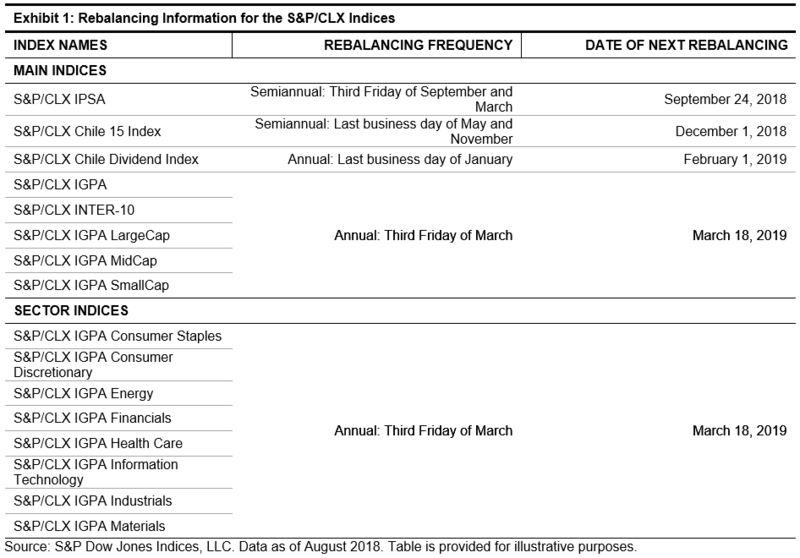 Exhibit 1 shows all of the S&P/CLX Indices and their upcoming rebalancing effective dates. In addition to their regular scheduled rebalancings, all indices are reviewed quarterly for reweighting adjustments. These happen every third Friday of March, June, September, and December. The S&P/CLX Chile 15 Index and S&P/CLX Chile Dividend Index are the exception to this rule. The S&P/CLX Chile 15 Index only has two rebalancings per year, and the S&P/CLX Chile Dividend Index has a reweighting on the last business day of July. 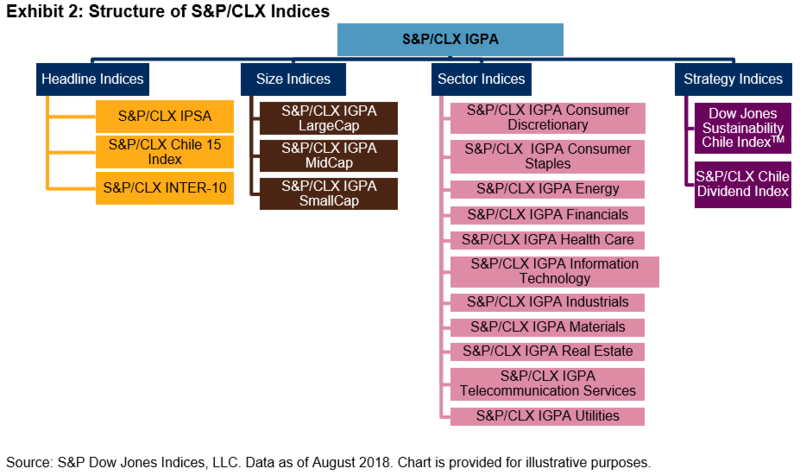 On Sept. 7, 2018, S&P DJI published the list of components for the S&P/CLX IPSA and their respective weights. These changes will be implemented after the close of business on Sept. 21, 2018. All of the changes previously announced that resulted from the public consultation conducted in April will be implemented. Based on the data published on Sept. 7, 2018, we calculated that the overall rebalancing turnover for the S&P/CLX IPSA is expected to be around 11%, one-way. However, the turnover not only considers the reduction of the index to 30 stocks from 40, but it also considers changes in the number of shares outstanding and in the float factors, which on average was reduced by 6% in the entire index. This resulted in changes to the float-adjusted market capitalization, which ultimately determines the weights. The S&P/CLX IGPA will not have a full rebalancing, but it will have a reweighting. As mentioned, the composition of the index will not change at this time; however, all of the companies’ float factors and shares outstanding will be updated. Normally, this would not be a major event, since the changes during reweightings tend to be small, but this time the changes may be significant, particularly because the float factors are changing to align with S&P DJI policies and practices. Besides the S&P/CLX IGPA and the S&P/CLX IPSA, the S&P/CLX INTER-10 and the size and the sector indices will also undergo share and float factor updates in September 2018. This ensures data consistency across all the core indices. Exhibit 2shows the structure of the new index series, with the S&P/CLX IGPA as the headline index. Stay tuned to see the development of the S&P/CLX Indices as we work closely with the investment community to launch new strategies that will measure the different aspects of the Chilean market.